Have you ever noticed how many immigrants own their own businesses? Many of them came to America with little to nothing and therefore had nothing to lose. What a perfect time to start a business! If you aspire to start your own business, or try a new career, do it before you have too much to risk losing! Whether you are trying to attract that perfect partner or presenting in front of a boardroom of executives, confidence is absolutely key. If you lack self confidence, fake it for now and find it quickly. Pick a hobby or join an organization that will help you build your self confidence. For me, completing Navy Flight Training was the ultimate self confidence booster! With the advent of the Internet, you really have no excuse. You must network. I have example after example of how networking has helped me over the years. Enough said. Pretty straight forward, if you want a promotion, dress like your boss, not like your peers. There is more than one solution to your life’s puzzle, If you can’t find the right spot for the next piece, it’s OK to move to another corner of the puzzle! I went to school with a plan to work on Wall Street, but spent my first 8 years out of college in the Navy and ended up working in high tech sales. There will be twists and turns, embrace them, it’s part of life’s grand journey! It’s the best way to ensure you hold yourself accountable for yourself. If you don’t write them down, more than likely they won’t get done. A large percentage of successful people and millionaires didn’t do it for the money, they did it because it was their passion. Steve Jobs, Mark Zuckerberg, Sam Walmart, they were pursuing their passion, not a quick buck. Do what you love and you’ll never work another day in your life! It’s a well know quote, “it’s not what happens to you, it’s how you react to what happens to you”. This is the key to choosing your own attitude. It’s one of the only things that you have complete control over and it can be the difference between being generally happy or being consistently pissed off! When I finally learned to accept myself for who I am, along with all of my faults and idiosyncrasies, was the day I learned to laugh at myself. More importantly, stop worrying about what others think of you. Of all the people you will encounter in life, 50% will like you, 25% will dislike you and the last 25% will always be making up their mind. You are who you are and your ideas and actions mean something to someone so stop trying to please everyone. Abraham Lincoln said you can please all of the people some of the time, and some of the people all of the time, but you can’t please all of the people all of the time. The best life lessons come from our mistakes. Some of the best and brightest sight their mistakes as the best learning moments in their journeys. Embrace your mistakes and own up to them, don’t make excuses, no one ever got ahead in life by being excellent at excuses. Who doesn’t enjoy it when the boss spends time with you at work? Well, I had quite the day with my boss back in 1992 when I was flying for the Navy. We were between deployments and operating out of our home base in Brunswick Maine when two flight crews (including mine) were assigned a 30 day mission to Rota, Spain. Our Commanding Officer (hereby referred to as the “Skipper”) accompanied us on this mission. The skipper didn’t fly missions with aircrews all that often, but when he did, it was cause for a bit more anxiety than the average everyday feeling that flying combat missions in a multimillion dollar aircraft typically brings. Even with the Skipper in tow, this trip was actually a great deal, fly sorties out of Rota Spain, spend some time in Garons France flying with the French Military, and visit other interesting places like Gibraltar. At the time, I had no idea that Gibraltar would be forever and permanently etched in my memory. Shortly after arriving in Rota, we received the news, we were to fly to Gibraltar, the strategic entry and exit choke point at the mouth of the Mediterranean Sea, and pay a visit to our friends in the British Military. Gibraltar, a British Territory, historically has been a significant source of contention between the Spaniards and Brits, and the two countries literally have held a grudge since 1713 when it was ceded to Britain by Spain in the Treaty of Utrecht. So much so that from 1969 to 2006, Gibraltar wouldn’t allow air traffic to fly directly from Spain to this small town at the southern tip of the Iberian Peninsula, nor would Spain allow air traffic to fly direct either (we’ll hear about this again later!). 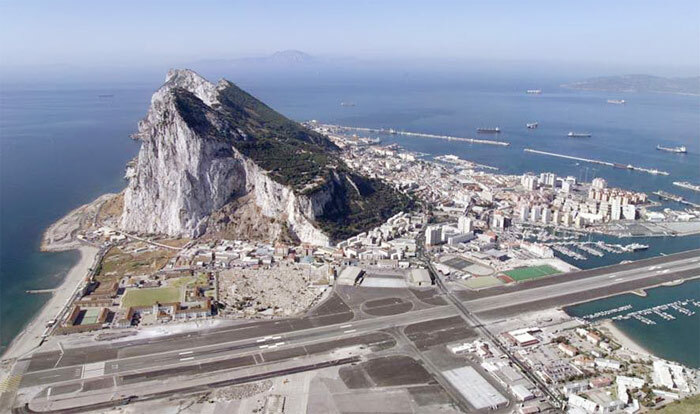 This densely populated territory is occupied by about 30,000 Gibraltarians and is literally a large rock surrounded by a town. It shares less than 1 mile of border with Spain and therefore there is only one road in and out of Gibraltar. The mission was simple enough, fly from Rota to Gibraltar and back, and take the skipper along. I was cautiously optimistic about flying with my boss, always good to get some quality time, but it does add a bit of an “inspection” feel to the mission. This, soon to be infamous flight, became interesting before we even boarded the aircraft. It was while the skipper and I were filing our flight plan (basically telling Air Traffic Control what our plans were) when I received my first surprise, after commenting how this would be a short flight, the skipper informed me that we couldn’t fly directly from Spain to Gibraltar. Of course I acted like I knew this already, not to look too much like a rookie pilot, but I was impressed with the bosses level of international flying knowledge nonetheless (“lesson one grasshopper, you must always review the special flight notices in the back of the flight planning charts”). So we proceeded, somewhat randomly, to select Portugal, the most obvious, albeit out of the way, non-Spanish intermediate point for a touch and go landing prior to arriving at our destination. I’d never been to Portugal, but the visit would be short lived, as a touch and go is literally that, wheels touch down and then full power, you fly back into the air. The first leg of our journey began rather uneventful, with me in the first pilot seat and the skipper flying co-pilot. We executed a flawless (if I may say so myself) touch and go in Portugal and then began our final transit to Gibraltar. After a short transition out of Portuguese airspace, we soon approached the large ominous rocky landmark. As we spotted Gibraltar on a visual approach, one couldn’t help but realize why this fortress of a city standing guard high above the narrowest point in the Mediterranean held such strategic historical significance. I was able to limit my fixation on the rock to a few seconds (we are trained in flight school not to fixate) when I glanced back to line up on the main runway I noticed the oddest sight, cars crossing right across the middle of the runway! We’re trained to abort landings if anything is spotted on the runway so in a very controlled panic I asked the skipper if I should proceed or wave off the approach. This is when I received my second lesson, always review the destination airport for any unique situations, and in the case of Gibraltar, we had a classic unique situation, the main road into town crosses the main runway. We proceeded with our intentions, and just like a well timed railroad crossing, right before we touched down the gates came down and stopped the car traffic until we had safely passed. If you pull up a map of Gibraltar, you will quickly see that the only space for an airport is at the border, right where that main road happens to cross, which makes for an interesting transportation bottleneck to say the least. We had a great visit in Gibraltar but my mind was preoccupied with already having received two lessons from the Skipper on this still young trip. I was determined to finish strong and the rest of this day wouldn’t disappoint. We proceeded to file our return flight plan and collectively decided that we would go home via a different route. This time, Tangier Morocco sounded like a great option, the country at the Northwestern tip of Africa was just a short 9 miles away on the other side of the Straights of Gibraltar, the narrowest point of the Mediterranean Sea. So we not-so-ceremoniously said goodbye to our British friends and departed Gibraltar to the waves of dozens of cars patiently awaiting their turn to cross the runway. Fortunately, the aircraft have the right of way! The trip to Morocco would be very short, and as quick as we took off, we were suddenly setting up for our touch and go at the Tangier’s International Airport and talking to the Moroccan Air Traffic Control (ATC). English is the international language for flying but the quality of the English sometimes makes you wonder if they’re really speaking English. It’s ironic that something as important as ATC to Pilot communications would be subject to so much potential error with the broken English we often have to deal with in the air over foreign lands. Everything seemed to be going smooth as we set up for our touch and go, but little did we know we were minutes away from a potential international incident! The communications with ATC were extra challenging that day and I was struggling to understand the instructions that were being passed to us on final approach. The Skipper and I looked at each other puzzled as the controller seemed to have something very important to say, we just couldn’t understand exactly what! Typically, even when dealing with broken English, we can decipher what is being said because we have an idea of what type of information is being passed at any given point during the approach (active runway, altitude, number 2 for landing, etc). However, this gentleman clearly had something more on his mind. So as we continued our approach for landing, literally as we were seconds from touchdown, I said to the Skipper, “I think they’re telling us we need State Department approval to land here”! The Skipper retorted, “Are you sure”? I replied, “I think I also heard something about an international incident, I am going to wave off our landing Skipper”! Ever so hesitantly he agreed and said, “I hope you’re right, go ahead”. In the end, I am fortunate that in the face of uncertainty I spoke up, as ATC was specifically telling us that a US Military aircraft needed State Department approval to land (even for a touch and go) in Morocco. The Skipper was very grateful that I ever so closely adverted disaster and in the end, I was able to gain a little respect from the boss. You see, when you get the chance to spend a day with the boss, you should see it as both an opportunity to learn as well as an opportunity to shine. There have been many extensive studies on cockpit crew communications, especially when there is a superior/subordinate situation in play. This is also a factor in many emergency rooms where nurses are often intimidated by the surgeons and won’t speak up if they see something that is wrong. I find it intriguing that the simple fear of speaking up to a superior continues to be a factor in emergency room errors and aircraft mishaps that have led to both injuries and fatalities. I learned a lot from my skipper that day and I grew a bit as a pilot as well. In the end, I was glad he came along on that mission and on many subsequent missions. From a leading, coaching, managing perspective there is no better way to teach as well as learn. The Skipper in this story is Skipper Hill, who left this world much too early this past year. This blog entry is a tribute to him and his leadership, which lives on in me today. To this day, I continue to learn from the people I lead and I hope that they will continue to learn from me. A common trait of good leaders is the ability and willingness to admit they don’t know everything and seek the advice of others, even from a subordinate now and then. So the next time you spend a day with the boss, be sure to speak up, because if your boss is a true leader, they’re very interested in what you have to say! Is your organization running on all cylinders? Is your organization capable of running on all cylinders? You may be getting the most out of your current infrastructure, but is you organization’s capability optimized, set up to produce 100%? An inefficient organization will never reach full capability or capacity. Don’t confuse inefficiency with under-capacity. When a cup is only half full, this represents under-capacity, not utilizing everything that’s available. However, if you picture a paper cup being squeezed such that it can’t hold as much as it once did, this represents inefficiency. An inefficient organization will never reach its full capability or capacity, it is not possible as some of their potential is being squeezed right out of them. When an organization has learned to yield its maximum potential, we can call this the “optimized organization”. Are you in need of a corporate “tune up”, are all of your organization’s cylinders firing but you’re just not getting full power? Maybe suboptimal performance, processes and/or behaviors are holding you back. Let’s consider your organization’s weaknesses. I’ve always said a home builder is only as good as his worst contractor. Every contractor plays such an important role in the building of a house that one bad contractor can ruin your whole reputation, and in home-building, reputation is everything. This is the weakest link concept, “only as strong as your weakest link”. An offensive line in football is much the same where one weakness can be exploited by the defense and can overshadow the other stronger linemen. Have you identified your weakest links and ensured that you are leveraging their strengths and not exploiting their weaknesses? In the book, “First, Break all the Rules”, authors Buckingham and Coffman say you shouldn’t try to change or improve people’s faults, instead you should focus on their natural strengths. Through proper resource utilization, you can minimize the weak links in your organization. Once you have your people in the right roles, how do you optimize even more? The concept of synergy, the sum of two parts being greater than the whole, is a big factor when looking at optimized efficiency. When you have a micromanaging environment, where 2 or more people are focused on the same task, the output is very often less than the whole. When you set your people loose, you can truly achieve a synergistic effect as an empowering environment and culture creates a synergistic effect. In most assembly line style manufacturing environments, the line workers are told to optimize the process they’ve been given. In empowered environments, not only are they optimizing the process they’ve been given, they are also always looking for ways to improve the process, “expand the cup”. There are many documented cases from automotive assembly lines where the line workers had the best ideas for improvement but in most cases, they were never asked. In the cases where their opinions were sought, amazing improvements were often the result. So by making continuous improvement everyone’s responsibility, you create a synergistic effect by getting more out of each and every employee. Why are processes suboptimal in the first place, why didn’t we just get it right the first time? There’s a story of a young mother cooking a roast for guests and before she puts it in the pan, she cuts a portion of each end off the roast. When one of the guest inquires into the genesis of this unique chef’s secret, the mother replies, “well, that’s just the way my mother always did it”. The reality is that her mother’s roasting pan was too narrow for most roasts, so she had to cut it to get it to fit into the pan! Many organizations today operate under this same mantra, “that’s just the way we’ve always done it”. Well, has anyone stepped back and asked why we’re doing it this way? The status quo may have worked at one point, but as markets, resources and priorities change, you have to change your processes too, organizations must focus on “continuous improvement” to ensure that they are always optimized for the best performance. Yogi Bera once said, “We’re lost, but we’re making good time!”. You may think you’re making good progress, but are you certain you’re “not” taking the long way? You may feel like you’re doing the best you can and when you’ve finally topped off that cup, it may appear that you’ve succeeded, but then you take a step back and realize that you could be expanding your capability and getting more into that cup after all. This is what separates good organizations from great ones, the latter make “continuous improvement” a habit and are always looking for new ways to expand the cup. So if you want to keep your organization in its peak working condition, always look for opportunities for that next tune up! The mind, at the risk of sounding cliche, is truly a powerful thing. The power of persuasion by your mind, whether it’s internally or externally initiated, is truly fascinating! One of my favorite TED talks is Dan Gilbert’s lecture on happiness, where he reveals the mind’s amazing ability to rationalize any situation. He reveals a surprising slide that shows equal rates of satisfaction between lottery winners and paraplegics. Dan explains that when presented with a situation that can’t be changed, the mind has the ability to not just merely adapt to, but to actually accept the situation as for the best. A simple but interesting example from my own life occurred when I left the Navy and started my career with IBM. My first 6 months was to be spent at a training site in Michigan with about 25 other new hires. Since most of us lived in other states, I agreed to share an apartment with a colleague. When we were informed by our chosen apartment complex that the only apartment available didn’t have a dishwasher, we were at first disappointed (who wants to do dishes! ), but eventually convinced ourselves that this would be just fine. As it turned out, not only did we manage to rationalize the lack of this little luxury to the point of satisfaction with the situation, but our minds had truly fooled us. You see, we lived in this apartment for a full 6 weeks, scrubbing away at those dishes, only when the sink could be heard calling mercy, before I noticed an appliance in our kitchen that looked amazingly like a dishwasher! Yes, we were dumbfounded for a few moments, wondering why we didn’t notice it earlier. The mind is a powerful thing! So how do these head games apply to leadership and management? Motivation can be both internal (a self motivated individual) or external, as from a management perspective, where the genesis is typically purely external. Just as we can convince ourselves that we’ll be better off without that dishwasher, a good manager can motivate someone to believe they can do better, or in the negative case, to believe that they are a failure or worthless. Some minds are strong enough to overcome negative input and actually turn it into a powerful self motivator. External motivation can come in many forms including competition, peer pressure, fear and even from a simple motivational poster. I mentioned before the mind’s ability to self persuade, both from internal and external sources. Some of the best examples of internally generated self motivation are from the sports world. Examples such as Babe Ruth’s called home run in the fifth inning of Game 3 of the 1932 World Series. Or Tim Tebow’s emotional declaration in 2008 that he would push himself and his team to play harder than any other in the country, after a shocking early season loss, only to convincingly run the table and win the National Title. These are cases where individuals were able to convince themselves of the possible, not that they willed it to happen, but they significantly increased their odds by believing that it would happen. The skillful ability to motivate yourself or someone else to achieve a goal, or to some level of achievement, is only eclipsed by a great leader’s ability to inspire someone from within. Inspiration actually creates the desire (or want) to achieve from within where motivation convinces an individual that they should do something. When you walk out of a inspirational movie, you want to go do something great, not because the movie or actors told you to, but because the story inspired you from within to want to do so. A great leader has this ability to make you want to do something without actually having to specifically direct you. Leaders have the ability to inspire, generating your own internal motivators, whereas managers motivate, creating an external source of direction and cause. So whether you consider yourself a leader, a manager, or a follower (the reality is everyone has the chance to be all of the above at one time or another), be aware that your actions, words and thoughts have great influence on not only others, but yourself as well. This video clip is a simple example that demonstrates this with a coaches ability to motivate a player, a player’s ability to inspire his team, and the mind’s ability to fool oneself to accomplish something that was previously thought impossible. Remember, when it comes to persuasion of one’s mind, everyone has their head in the game! My first 5 years out of college were spent flying the mighty P3 Orion for the US Navy. This is a maritime patrol aircraft whose main mission is anti-submarine warfare, but also engages in search and rescue, mining, drug smuggling interdiction (mainly in the Caribbean) and reconnaissance. Many times when we encountered surface ship traffic on a mission, we would fly down to 2oo feet above the water and execute the infamous “fly by” to get a closer look at the vessel. Officially, this was a maneuver which allows us to get intelligence photographs of foreign ships, but unofficially, we often did this just to satisfy our natural curiosity and to have a little fun! On one particular mission we were patrolling a large body of water and I was in the left seat and had a good friend of mine in the right co-pilot’s seat. I positioned the aircraft to execute a fly by (in this case on a US Navy ship) and began my decent to 200 feet. Now, we happen to be flying into the sun on this pass, which really shouldn’t be a big deal when flying, but more on this later. As we approached the vessel, I waggled the wings to say hello to our fellow sailors and then as we were finishing our pass, I scanned the horizon to ensure the sky was clear for my full power “pretend for a moment that I am a jet fighter” ascent back up to a higher altitude. This was the fun part, you see the P3 Orion is not an incredibly nimble aircraft, certainly not like a fighter jet, but more like small airliner, low and slow was the name of our game. When we were chasing submarines 200 feet above the water, we could certainly yank and bank with the best of them, but this is a fairly large aircraft, with 4 large engines hanging off of the wings, you get the idea. It was at this point when things became interesting (not that flying isn’t interesting, but patrolling hundreds of square miles of open ocean does get monotonous at times). When the co-pilot isn’t flying, it’s their job to assist the pilot with communication, navigation, and monitoring the instruments. On this particular flight, just at the moment when we started our high power “pretend for a moment that I am a jet fighter” aggressive ascent, my trusty co-pilot was fixated on what he thought was the G-Meter (also called the Accelerometer). The G-Meter tells a pilot how many “G’s” the plane is experiencing at any moment, reading 1 in level flight, which is what you’re experiencing right now, unless you happen to have just jumped off a building (something less than 1) or ran your car into a wall (something much greater than 1). The P3 was rated for +3 G’s which really isn’t a lot considering the average jet fighter pulls more than 8 G’s at times. In hind sight, this was our “ah-ha” moment, as he was actually staring, not at the G-Meter, but at the similarly round and very much just like the G-Meter with a needle that moves in much the same way, called the Vertical Speed Indicator (VSI). The VSI tells us how many feet per minute we’re ascending or descending. There’s nothing wrong in particular with fixating on this instrument (although pilot’s are trained not to fixate on any one thing), but in this case he mistakenly thought it was the G-Meter. So as we continued our climb out, the fun began, as the VSI (which has a read-out marked in thousands, 1 through 5, plus and minus) quickly climbed up over +3. Yea, we were burning up the skies, P3 style, climbing out at a “throw more logs on that fire” 3,500 feet per minute and accelerating! So all my co-pilot saw was us approaching +4 and thinking it was the G-Meter (I think the flying into the bright sun factor may have played a part here), he began to push on the yoke as I was pulling it back (For those non-pilots, pull yoke back, cows get smaller, push yoke forward, cows get bigger). Now’s a good time to introduce a third person into this party, our flight engineer, who sits in the center, right between the pilots and closely monitors the engines indicators for errors with an intensity that would make a tennis net judge proud. The flight engineer, typically a salty old sailor (who really knows his stuff), helps the pilots monitor all of the engine and systems status and health. The flight engineer was also typically the elder crew member and was a respected, integral part of the cockpit. Back to the action, where the co-pilot and I were deadlocked in our “push-pull” tug of war on the yoke when the co-pilot looks at me and says, “I don’t like your attitude!”. As you can imagine, I was perplexed, so I replied, “you have a problem with my attitude?”. Cut to the even more perplexed flight engineer, who at this point looks like his winning lotto ticket was just blown out the window. He barks, “What the hell is going on here” (with all due respect of course), as he thought we were having a little “you hurt my feelings” tiff in the cockpit 200 feet above the ocean going fast enough to fly into the water in about 4 seconds. So let’s freeze for a moment to sum up this scenario, we were 200 feet above the water, climbing at full power ceremoniously away from a US Navy warship, the co-pilot thinks I am over stressing the aircraft, the flight engineer thinks we’re having a social conflict and me, I am just wondering what the heck was slipped into my co-pilot’s coffee this morning! Well, you’ll be glad to know that we all survived this incident unscathed for you see, as it turned out, the “attitude” comment wasn’t an assessment of my leadership style or personality, but it was his concern that the plane’s attitude (angle of ascent) was too high, thus creating the perceived +3 G’s situation in his mind. Collectively we were able to quickly determine the source of the confusion and rectify the situation so we would live to fly again. Needless to say, our little adventure was the source of much laughter at the Officer’s Club that night and for weeks to follow! Effective communication and teamwork is critical in just about every endeavor that you will engage in throughout your life. In our hurried, fast paced business climate today, it is increasingly easy to take short cuts, jump to conclusions and misinterpret the messages that are presented to us. Personally, I have more than once, taken an email out of context because I read it too quickly, or was distracted (sun in my eyes!) while reading it. In our increasingly virtual work world today, effective communication is even more important and vastly more challenging. If three people can have a communication breakdown sitting right next to each other in a cockpit, you can imagine the obstacles that virtual teams present. In my role managing a virtual team, I stand by the mantra, “communicate clearly, early and often”. In addition, I try to make it a priority to eliminate multi-tasking while communicating, whether that’s a phone call or reading an email. We are all presented with many obstacles to effective communication (not unlike the challenges we faced in the cockpit that day) and it is imperative that we recognize these obstacles and overcome them quickly. So the next time you find yourself in your own version of our “attitude problem”, it is very likely just a misread of a team member’s true intentions. Just determine what the instrument of the confusion is, and quickly get the team back on board. Because when everyone over communicates and works together, it’s like having your mission on autopilot. On a recent back roads trip to visit a remote customer, I decided to use my trusty GPS system for guidance. There I was, cruising comfortably along, assuming that I had set the GPS up correctly and entered the right address for a successful journey. Then, out of the blue my friendly on-board computer says, “In four hundred yards, continue straight”. Interesting that this machine just wanted to assure me that I was still pointed in the right direction. I really hadn’t received any directional instructions in a while, so quite frankly, I was beginning to wonder if I was still on the right track. It really was rather reassuring to have that interim positive update! In general, giving consistent feedback is a good philosophy to follow, and unlike the typical back seat driver, the goal here is to focus more on positive feedback. In any organization, whether you’re dealing with your lower performers or your number one star, everyone needs a nod now and then to know when they’re on the right track. It is often believed that your superstars don’t need as much attention, that they’re self motivated. Everyone benefits from motivation and recognition, even your best performers. A perfect example is a star athlete or even a renowned scholar who has always performed at the highest levels and succeeded above most others. Even with a rich history of success and accolades, the one thing at the top of their mind is will they be tapped for the highest recognition. In the case of the star athlete, it’s probably the hall of fame for their sport, and for the renowned scholar, it could be the Nobel prize. So you can see, even your most talented employees are most likely still wondering if they’re fully appreciated. Furthermore, recognition shouldn’t be reserved for the elite few. We should never assume that someone knows they’re doing a good job and knows they’re appreciated, that is the quickest way to accomplish just the opposite. If your goal is to keep everyone engaged and in the game, they have to know that their work matters, and their good work matters even more. There are many ways to recognize everyone’s solid work or positive outcomes, and even a simple mention of an accomplishment at a team meeting will go a long way. As long as your recognition is justified, and also selective enough as to not be overdone, it will continue to be a very effective motivational tool. So go ahead and and be that back seat driver, just remember that even your best drivers will appreciate hearing from you now and then. For the past month, the untimely passing of Michael Jackson has dominated the press. I won’t deny that he was a very talented artist, however the cult like worship of him and the fanfare surrounding his funeral is just hard for me to comprehend. My role models are my father, veterans and heroes of American wars past and present, inventors and entrepreneurs, our founding fathers, selfless public servants, you get the idea. Sure there are artists (musicians, actors and actresses) that I enjoy and athletes that I admire, but I see them as people, just like you and me, who happen to have a unique talent. On the other hand, it’s those people who use their talents to change the world, protect our freedoms, and truly make a difference who are the true heroes worthy of fanatical worship ( I am not necessarily suggesting we should worship them, just that they are worthy!). If we held public servants and teachers in higher regard, and publicly supported our soldiers as much as we do our favorite artists and athletes, this world would be a much better place. The overzealous infatuation with the stars of the media is not an intellectually healthy pastime. It is fine to be passionate about an artist or athlete (I know many who are big fans of Michael Jackson), however when this passion comes at the expense of engaging in healthy obsessions, then it becomes counterproductive to society. It is healthy obsessions that have produced this country’s great innovations and companies, artists and athletes, and the reason many still go into public service with a passion to help others. Yes, I included artists and athletes. These are great vocational choices, and they do provide a service to society, but it’s obviously better to aspire to be one rather than excessively idolize one. On the subject of star athletes, who have really become larger than life in recent years, there’s been plenty of press lately due to huge off season multimillion dollar contract signings. Now, I believe in free market capitalism and I also understand the supply and demand economics of pro sports. As long as people are willing to shell out big money to watch the games, and support their teams, then the sports leagues can justify the big salaries. The fundamental anomaly I see however, is with the food chain, the circle of life for a pro athlete so to speak. Our school districts across this nation are struggling to fund their budgets and in some cases canceling sports programs, and yet there is a seemingly continuous flow of millions into our pro sports teams. If you think about it, school is basically the initial training ground for pro athletes (both intellectually and physically). It seems a little ironic and self defeating that we would allow our schools to suffer, jeopardizing the very core of youth development, all while applauding the bigger and bigger contracts when we land that star player on our team. Neglecting the very source of today’s treasured sports heroes presents somewhat of a paradox. This would be like fishing a lake dry only to realize that there are no fish left to repopulate the lake. Please note, as a fiscal conservative, I am not suggesting that we over tax pro athletes and owners so we can fund our schools. I am only pointing out the moral conundrum that this presents. My goal is to put a little perspective around priorities today and give us something to think about. If you’re reading this, you probably already agree with most of what I’ve said here, but unfortunately, much of society doesn’t quite get it and the media’s untiring coverage of celebrities and athletes only fuels the fire. Not so long ago, our heroes included astronauts, soldiers, scientists and explorers and our values were much more grounded. I’d hate to see this spirit fade away and become mere ghosts to that of the (less deserving) modern day media heroes. That is why it’s vital that we exercise the personal leadership to keep the focus on the right priorities (and maybe the media will follow, someday). Thank a veteran, hug a nurse, teach history, coach a youth team, invent something, drop off cookies at the fire station, volunteer with Junior Achievement, go to the school bake sale, support your PTA, learn an instrument, run for your school board, and of course, call you dad. The bottom line is never lose sight of the people and values that should really be at the top of our list. By keeping our priorities in check and personally investing in each other, we will sow the seeds for a fundamentally better tomorrow.